First we should understand that SCVMM Self-Service portal is using ActiveX controls to connect the remote VM. The Self-Service Portal is accessed using Internet Explorer which requires ActiveX controls to provide remote access to virtual machines on managed hosts. When a user uses the Self-Service Portal to view or connect to any of their virtual machines, they will be prompted to install the appropriate ActiveX control in Internet Explorer on their local machine. Self-Service Portal will use ActiveX control VMMCtlAx and VMRCActiveXClient to connect with the remote VM, both ActiveX control are using RDP protocol to talk with remote VM. Reason: U1 is using machines from external world to connect to ssp.company.lcl -> Active X got installed on U1 machine -> for connect operation- This active X instead of going through Website directly goes to host for connect operation -> As Hyper V and U1 are on different network -> it is not working. Workaround : You can check if somehow you can provide direct connection of host to U1 user machine. Based on this behavior, we can learn that we cannot publish Self-Service Portal via ISA to connect VM via HTTPs. The VMMSSP 2.0 SP1 Beta review program is now open. Tell us what you think! Download the beta and provide us with your feedback, especially in the areas of its usefulness, usability, and impact. Send an email with your input to sspfeedback@microsoft.com. · Usefulness: What portions of the tool are the most useful to your organization? · Usability: Is the solution is easy to setup and neviagate through? · Impact: Do you anticipate that this tool will save you time in your organization? Has this tool had a positive influence on your opinion of the Microsoft technologies it addresses? When you deploy or migrate a virtual machine to a host, the evaluation and selection of the most suitable host for the virtual machine is known as virtual machine placement, or placement. During placement, Virtual Machine Manager (VMM) evaluates the suitability of available hosts and assigns each host a rating of 0 stars (not suitable) through 5 stars (very suitable), in half-star increments. Each host’s rating is based on several factors, including the virtualization software on the host, the hardware and networking configuration of the host and the virtual machine, the virtual machine’s resource requirements, and whether the virtual machine is highly available. Load balancing Minimizes the processing load on any one host. Use this option if you want to distribute the performance load of your virtual machines evenly across your hosts. VMM evaluates all hosts within the selected host group and also any hosts contained in child host groups. The ratings are based on the default placement settings and do not change based on the ratings of other hosts. Each host must be able to accommodate the host reserves and the maximum resource allocation for all of the hosted virtual machines. Host reserves are the resources set aside on the physical host computer for the host operating system. Physical hard disk space The host must have at least one hard disk with enough space to hold the total hard disk space required by the virtual machine. With dynamic hard disks, the current hard disk size is used, not the maximum hard disk size. Memory The memory required for the virtual machine must be less than the current amount of memory available on the host. A host must have sufficient free memory to start the virtual machine. Network connectivity The virtual networks required by the virtual machine are checked against the virtual networks available on the host. The host must contain all of the virtual networks required for the virtual machine. If you use network tags, the network location and the network tag for the virtual and the host machines must be identical, or the host rating will be 0 stars. 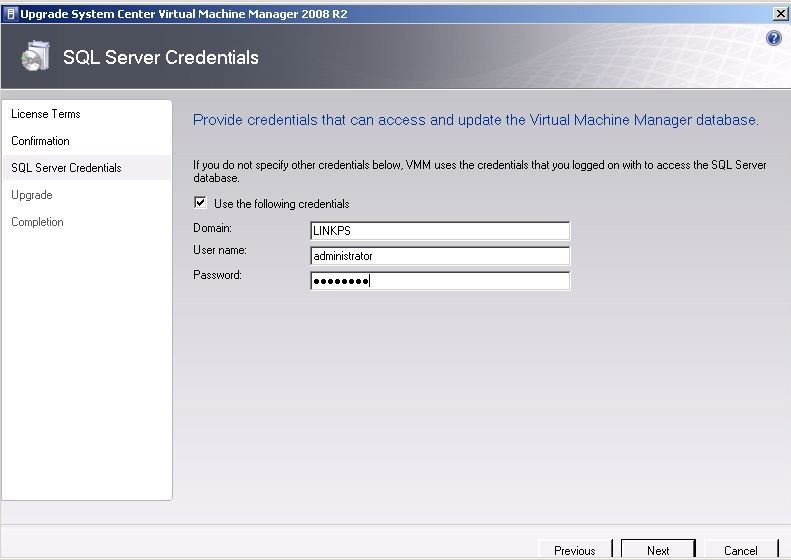 For more information, see Configuring Virtual Networks in VMM. Clustering Highly available virtual machines should be placed on clustered hosts. VMM will assign 0 stars for a non-clustered host but will not block the action. You should also ensure that migrations on the same cluster do not violate the cluster reserve limits. For more information, see How to View and Modify the Properties of a Host Cluster (http://go.microsoft.com/fwlink/?LinkID=162986). Moving from Hyper-V VMM will block migration of virtual machines from a Hyper-V host to a host that is running different virtualization software. 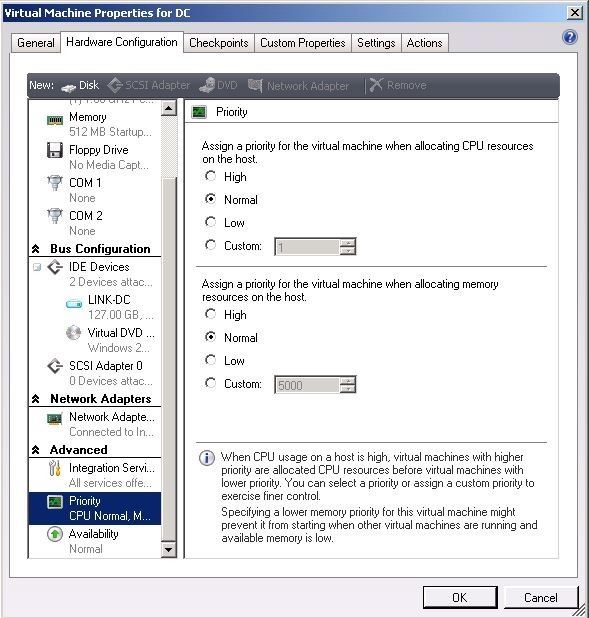 Virtualization software compatibility VMM will block migration of a virtual machine with specific features that are not allowed by the virtualization software that is running on a host. For example, VMware hosts do not allow IDE hard disks, and Hyper-V hosts do not allow booting up from a SCSI hard disk. Host ratings are recommendations based on default criteria that you can customize or override during placement. Host ratings do not include every relevant piece of information. For example, the host rating calculations do not include the speed of network connections. You can place a virtual machine on a host regardless of its rating if the host has enough physical disk hard space and memory available. However, placing a virtual machine on a host with a higher rating provides better performance for the virtual machine. Use the following best practices to help ensure accurate host ratings during placement. You can monitor trends in host and virtual machine usage over time by scheduling periodic reports in Operations Manager. For more information, see Configuring Operations Manager Integration with VMM (http://go.microsoft.com/fwlink/?LinkID=159865). Add default virtual machine paths for each volume of a host on which you want to store virtual machines. You must do this if you plan to support virtual machine self-service. For more information about how to add a virtual machine path to the host, see How to Set Placement Options for a Host. For more information about virtual machine self-service, see About Virtual Machine Self-Service. 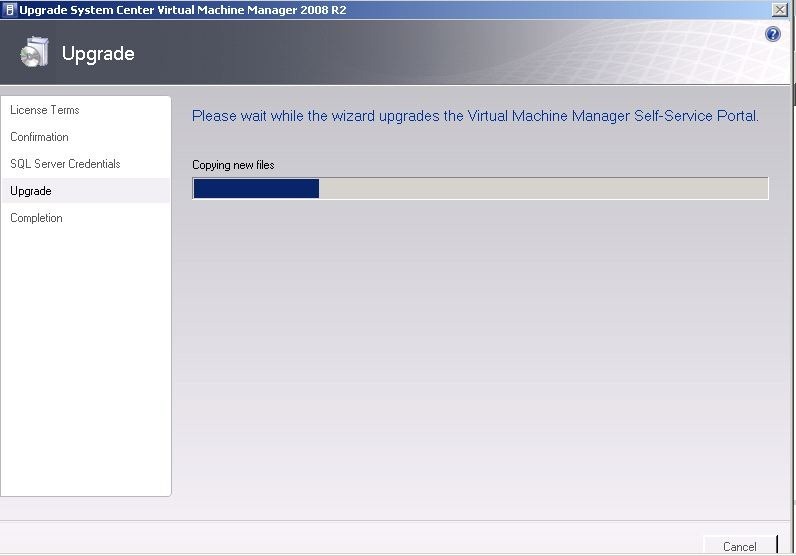 VMM 2008 SP1 RC is out, So I think it is the good time to start testing and deploying it. 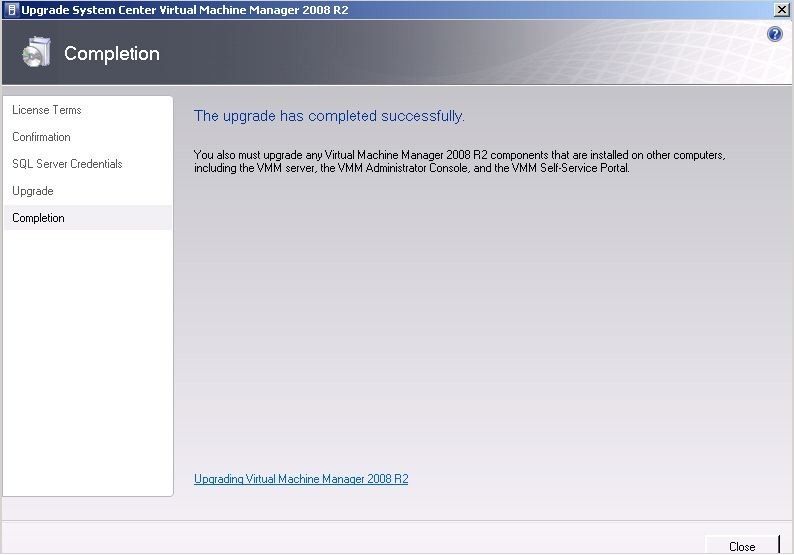 I took the chance and upgrade my test lab to VMM 2008 SP1. 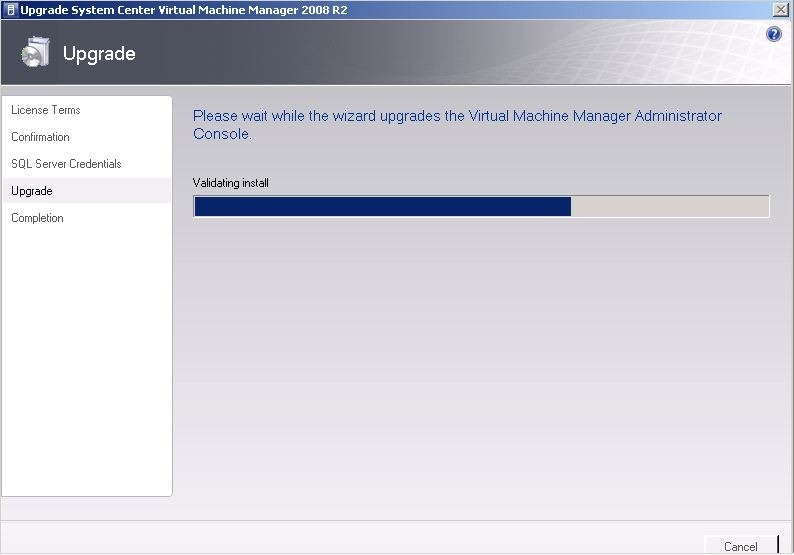 This post provides step-by-step instructions for upgrading to System Center Virtual Machine Manager (VMM) 2008 R2 Service Pack 1 (SP1) from VMM 2008 R2 while retaining your previous VMM data. 1. 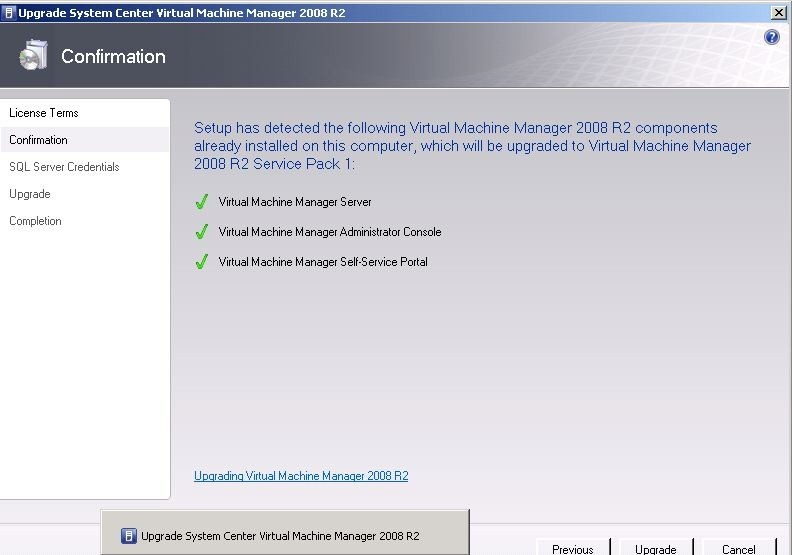 Log on to the VMM server that is running VMM 2008 R2. 2. On the product media or the location where you saved the Setup files, right-click Setup.exe, and then click Run as administrator. 3. 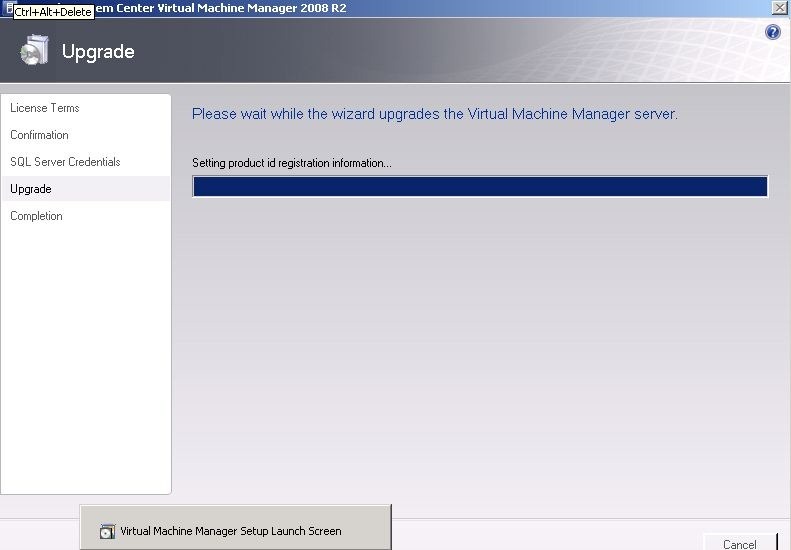 On the Setup menu, click VMM Server to open the Upgrade System Center Virtual Machine Manager 2008 R2 wizard. 4. Review and accept the license terms, and then click Next. 5. 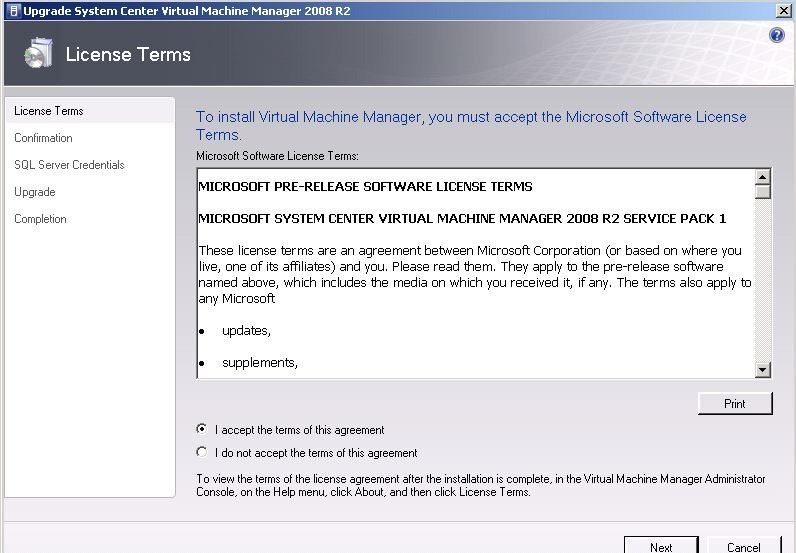 On the Confirmation page, verify the list of VMM components that are already installed on this computer. 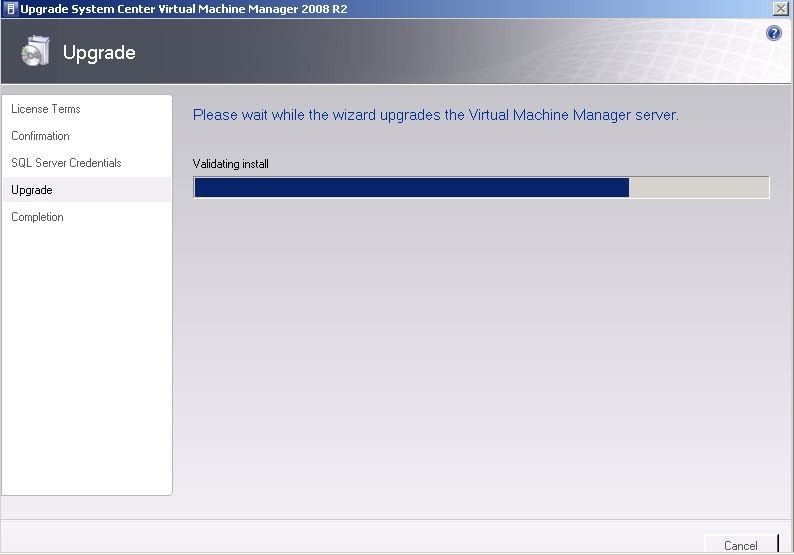 To upgrade all installed VMM components, click Upgrade. a. To use the same credentials that you are logged on with, click Next. b. To provide a different set of credentials, select the Use the following credentials check box, type the credentials, and then click Next. 7. 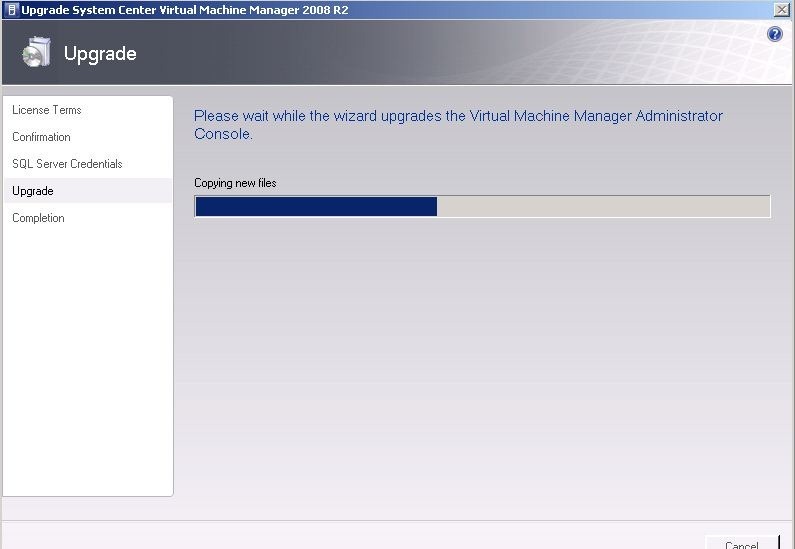 The Setup will start updating VMM Server, VMM administration console and Self service portal. 10. After upgrading VMM, all hosts and library servers must be refreshed to show the correct status. To perform a manual host refresh, in the upgraded Administrator Console, in Hosts view, select one or more hosts, and then, in the Actions pane, click Refresh. You can check the status of the host refresh in Jobs view. 11. After a host has been refreshed, it will have a status of Needs Attention, except for the VMM server if it is also serving as a host. This is because the stand-alone hosts still have the previous version of the VMM agent installed. These hosts are fully functional, so you do not have to immediately update the agents on all hosts. 12. To update the hosts, in the VMM Administrator Console, in Hosts view, select one or more hosts with a status of Needs Attention, and then in the Actions pane, click Update Agent. You can check the status of the agent update in Jobs view. When the refresh is complete, the host status will be OK.
13. To perform a manual library refresh, open Library view, select one or more library servers, and then, in the Actions pane, click Refresh. If you do not perform a manual refresh, the default library refresh interval is 1 hour. You can check the status of library refreshes in Jobs view. 14. After the library refresh, in the VMM Administrator Console, navigate to Administration view, and then click Managed Computers. 15. 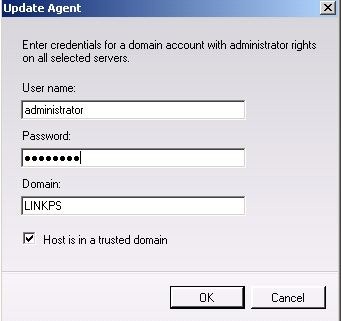 Select one or more computers that have a role of Library and an agent status of Upgrade Available, and then, in the Actions pane, click Update Agent. When the update is complete, all stand-alone library servers will have a version status of Up-to-date. For a highly available library server, the version status of each cluster node is updated after the next library refresh. 16. 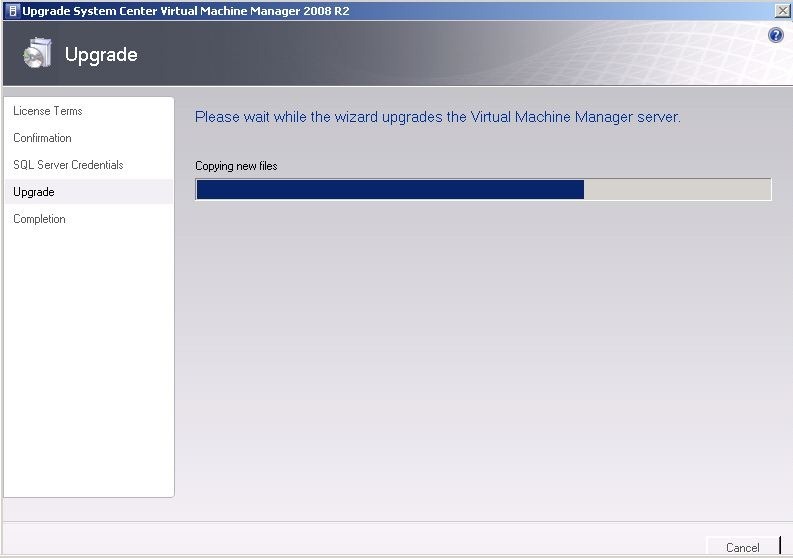 After upgrading VMM, update Operations Manager integration, if necessary. For more information, see Updating Operations Manager Integration After Upgrading to VMM 2008 R2 SP1 (http://go.microsoft.com/fwlink/?LinkID=199953). 17. 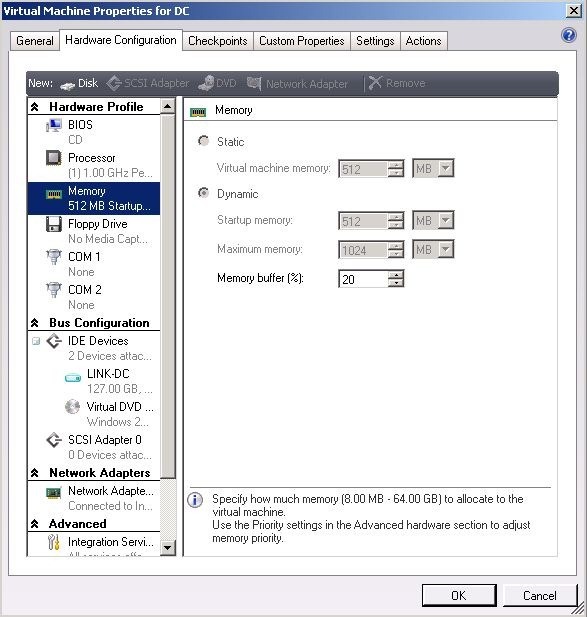 Check the new Dynamic memory setting in the VM configurations. 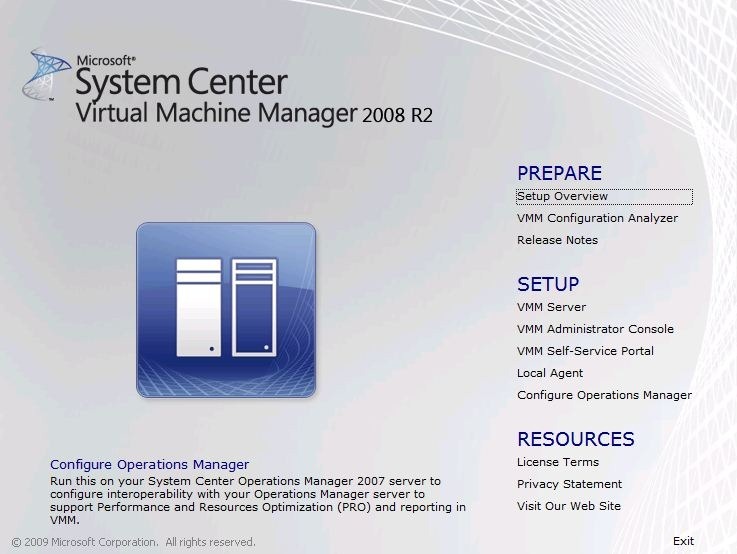 We’re pleased to announce SC VMM 2008 R2 Service Pack 1 RC is now ready for the general public! 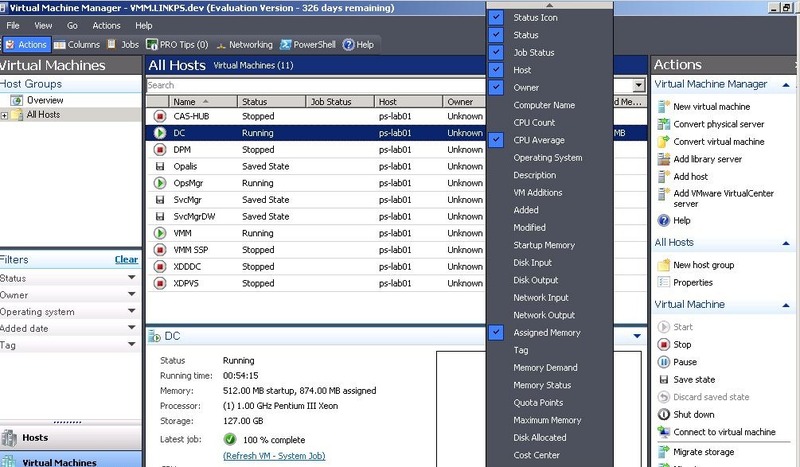 This release adds support for Dynamic Memory and RemoteFX in Windows Server 2008 R2 SP1 RC. Since this is a pre-release version, usage of this is limited to test environments. UPGRADE MATRIX: You can use this SP1 RC to upgrade from 2008 R2 and you will be able to upgrade from this SP1 RC to the SP1 RTM. Looking for a solution that helps you reduce IT costs, while increasing agility for your organization? Build a foundation for your Private Cloud with the Microsoft System Center Virtual Machine Manger Self-Service Portal 2.0 (SSP). Over the last year, we have been talking about the need to provide a set of capabilities, including self-service, to build a private cloud to deliver Infrastructure as a Service (IaaS). As Brad Anderson, corporate vice president at Microsoft, announced in his keynote at TechEd Europe in Berlin this week, SSP is released now. It’s free and fully supported! You can download it here. Below are some more details about what the Self-Service Portal is, which technology partners are extending SSP with integration packages today and where you can find more information like technical guidance. We also announced Hyper-V Cloud at TechEd yesterday, a set of programs and initiatives to help our customers and partners deploy private & public clouds to deliver IaaS based on Windows Server Hyper-V, System Center, and related products. SSP is a component of many of the Hyper-V Cloud offerings. You can read more about Hyper-V Cloud in this blog. The Self-Service Portal includes powerful extensibility features for Microsoft technology partners. Independent software and hardware vendors can customize different virtual machine actions (create, delete, stop, start, shut down, connect, pause, and so on) to take advantage of the unique characteristics of their infrastructure. We are working with a number of technology partners on Self-Service Portal integration packs.